While the equine veterinary professional maintains a busy, rewarding and multi-faceted lifestyle, the unique demands of the profession can create an imbalance in other important areas of life, such as family and personal time and self-care. "a conscious, self-directed and evolving process of achieving full potential." 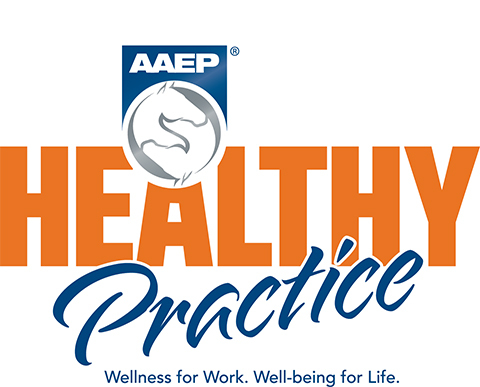 In a 2014 survey, AAEP members ranked work/life balance as their number one wellness concern, followed closely by physical health and mental well-being. The Centers for Disease Control and Prevention also found in a 2014 study that U.S. veterinarians are more likely to suffer from psychiatric disorders, experience bouts of depression, and have suicidal thoughts when compared with the U.S. adult population. Specifically, these data suggest that nearly one in 10 U.S. veterinarians might experience serious psychological distress, and more than one in six might have contemplated suicide since graduation.